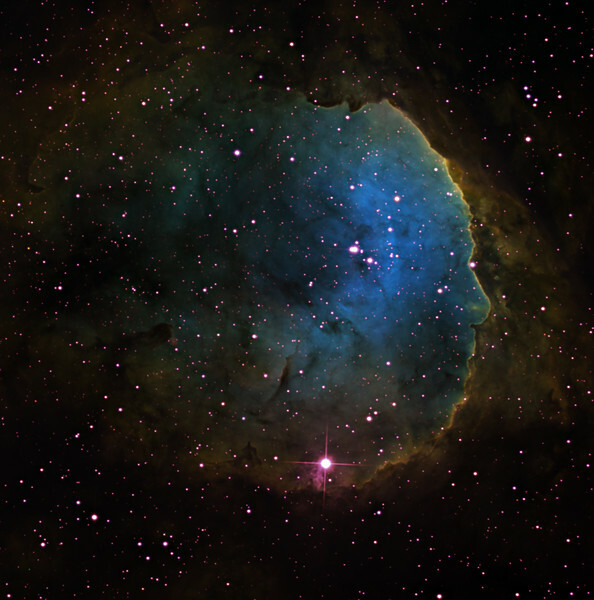 Gabriela Mistral nebula, NGC 3324, in Carina. Red: SII 2hrs, Green H-alpha 3hrs, Blue OIII 3hrs, all in 1hr subs. A very clear face, strong in OIII, seen in right profile. The face is outlined by a shock front strong in SII. This is a less heavily stretched crop of the adjacent image. Note the very strong shock front demarcating the profile of the face, and many delicate dust lanes.